Cat's Stuff: Where have I been? Did you even notice I was gone? I noticed. With the A to Z Challenge forcing me to log on to my blog every day for an entire month, I have felt lost without it. But I promised myself while I was on vacation that I wasn't going to touch a computer ... and I didn't. It was totally worth it! I was in NC all last week visiting family, and meeting my new granddaughter! Yes, that's right ... I'm a grandma! 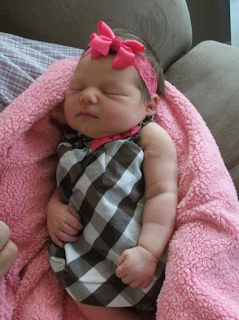 Zoey Marie was born on Tuesday, May 1st at 11:05 pm and weighed 8 lb 1 oz. The stubborn little thing made us wait all day, but it was so worth it. She is so adorable. I am so proud of Lizz (and Tyler too) who did a wonderful job delivering. They are going to be super parents! So, now that I'm back home (and missing my baby, and his baby like crazy), I can't wait to get back to blogging and catching up on my fellow A to Zer's. Hope everyone has had a wonderful first week of May! Thanks Danielle! And I know about that spoiling rule ... already got a plan to keep her styling in shoes for life! LOL!